One of the challenges for the novice guitarist is learning the basic chords. You will not only need to know where to put your fingers, but also how to change from one chord to another. The technique of smooth transition between chords is a learning process we are never really finished with. 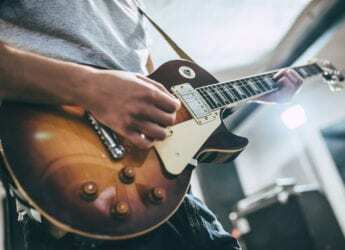 Every time we learn something new on the guitar, that’s another sequence of small movements our body learns, and these sets of movements must be executed smoothly through relaxed, calm practice. Holding chords with your left hand is a new skill. It uses groups of muscles we do not normally use, so it takes time to learn the chord shapes without experiencing discomfort. There is light at the end of the tunnel, although sometimes the tunnel seems very, very long. Another physical adaptation that has to be made when you learn your basic guitar chords is the left-hand fingers need to be toughened up. Callouses form on the tips of the fingers after a few weeks playing, but until they do you need to put up with the pain. Fortunately learning the notes on the guitar is a job that does come to an end. As you learn more songs, chords and scales you will feel your ease with musical theory and notation growing even if you didn’t directly learn much theoretical stuff. If you learnt in your own way the knowledge gets into you by way of constant practice and the enjoyment you bring to your guitar playing. So the task at hand is to learn a basic group of chords. This is your toolbox you begin your guitar playing with. Each chord is identified by a letter. If the letter is followed by the word, minor, it’s a minor chord. If it is just the letter alone, it’s a major chord. Major chords contain the Root note, a major third above the Root plus a fifth above the Root. Minor chords, which have a more “sad” sound, are the same except that they contain a minor third instead of a major third. major chord play the (1) (3) and (5) of the major scale, and for a minor chord play the (1) (3) and (5) of the minor scale. 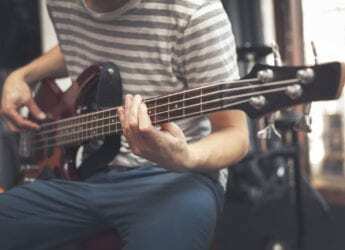 A handy thing to know once you start playing barre chords is that if you learn the major chord shape, you only need to lift one left-hand finger to play the minor chord. The basic chords come from the keys of A G C and D. The chords themselves can be played at all positions on the fret board, but beginners start with open chords at the first position. This means that at least one note is played on an open string. The A family contains the chords A, D and E.
The D family contains the chords D, E minor, G and A. 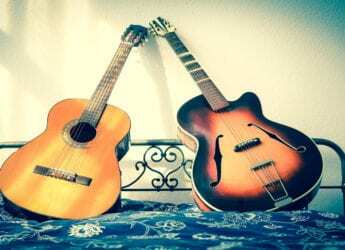 The G family contains the chords G, A minor, C, D and E minor. The C family contains the chords C, D minor, E minor, F and G.